A month ago the temperature hit 80º+, but like any aberration, it returned to the seasonal norm quickly enough. 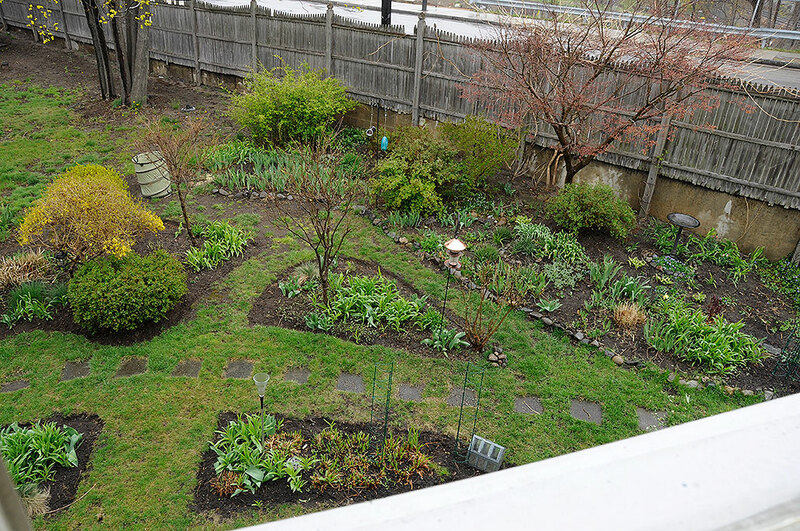 Those few days of warm weather in March jump-started all of the perennials in the RainyDayGarden and everything is about two weeks ahead of schedule. The only thing still lagging is the rain. Currently, the rain gauge is registering about 7″ less than what should have fallen by now. Fortunately, a little bit of rain (and hail!) finally showed up yesterday. The plants really needed it as they were pretty parched! Plants like the daffodils have been blooming since the end of March. A few tulips are starting to show some color and we expect to see one open in the next day or so, especially if the 75º forecast for tomorrow actually does come to pass. For now, the plants are just busy quencing their thirst. At this time of the year we always find ourselves resisting the temptation to buy more plants when we are at Home Depot. This is because there are always parts of the garden which look a little sparce, and so we have to remind ourselves that they will fill in soon enough. The grape hyacinths, lungworts, and violets started to flower last week. 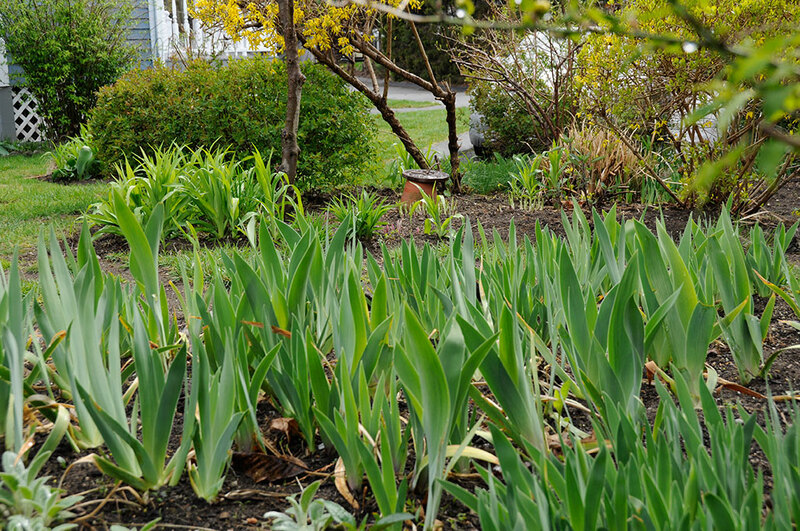 This week, the hostas, peonies, and others have begun poking through. The irises we split last June appear to have survived the Winter. In fact, they look quite vigorous. While we don’t expect any of them to bloom this year, hopefully they will be quite a sight in a year or two. As there is not much foliage yet on the trees, getting pics of local song birds are not difficult. Still, they are much more apt to pose for a photo if there is a bird feeder stocked with tasty treats. Mr. and Mrs. Cardinal live in a tall evergreen across the street, but every morning they swing by for their breakfast. We can hear them making a ruckus, especially if the interns are out checking the grounds. 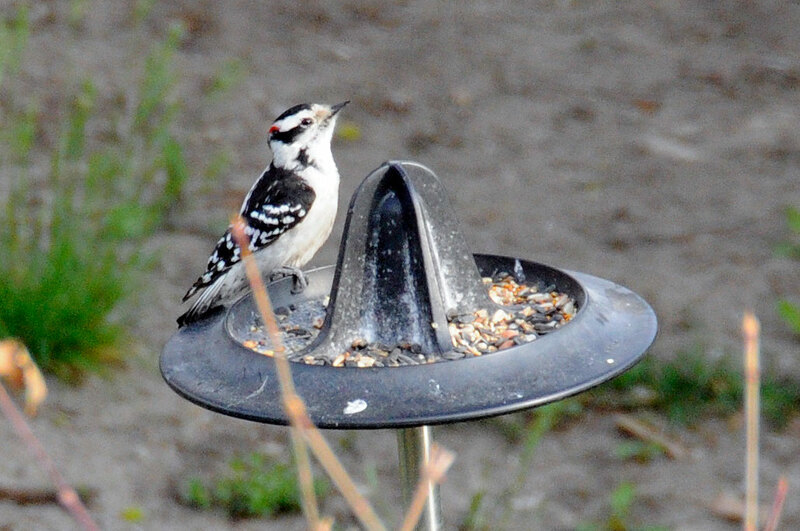 Mr. Woodpecker also visits around the same time, but unlike the Blue Jays, he will politely wait until the feeder is free before going in for a bite to eat. This weekend is Marathon Weekend in Boston. It has been a few years since we have gone downtown for the festivities. If the weather cooperates, we will be heading into town to catch the finish of the 116th running of race. Have a great weekend and we’ll back on Tuesday. Three Nor'easters in one month... are you kidding me?